The owners of the Sells-Floto Company, a traveling circus, left behind a big part of their show when they ended their short 1916 stint in Salt Lake City. 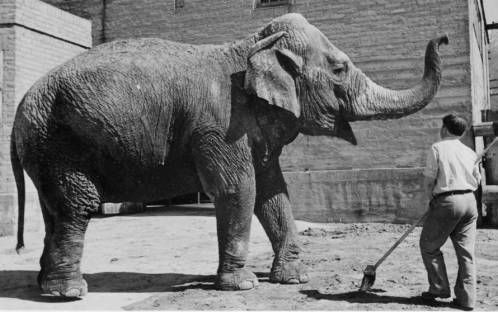 Liberty Park Zoo, a relatively new Salt Lake Parks Department venture, relieved Sells-Floto of a 9,000-pound elephant, Princess Alice, adding her to a 275 animal inventory that had been ballooning since the zoo started in 1911. And Alice's $3,250 purchase, made with Salt Lake schoolchildren's penny and nickel donations, did come as a relief to circus owners Frederick Gilmer Bonfils and Harry Heye Tammen. 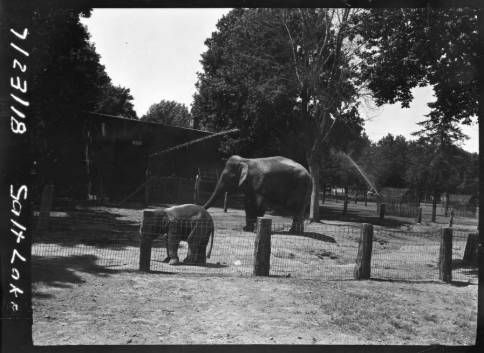 The pachyderm had become a slight nuisance and Bonfils and Tammen no longer considered her fit for circus purposes. Sells-Floto said goodbye to their princess and Salt Lake City welcomed its new royal resident. But Princess Alice would prove to be a nuisance in her new home too. In November of the first year of her reign, Liberty Park zookeepers tested her regal demeanor when they forced her to do some chores. They chained a wooden shed that needed moving to her frame and made her march. But after a few steps the building struck a tree, and, free of her burden and her chains, Princess Alice struck out, sick of laboring in the November cold. She left the park, stampeding south along the blocks between 300 and 500 East, demolishing fences and lawns along the way. At 2100 South the elephant turned east, maintaining her gait in defiance of the crowd of trainers, zookeepers, concerned citizens, and kids on her trail, and despite catching some barbwire around her neck. Alice turned south again near 900 East, stomping over vegetable gardens and picking up a collar of chicken wire. Continuing her course south and east the elephant made it all the way to the mouth of Parleys Canyon where her longtime trainer EM "Dutch" Scheider finally reached her, calming her while the other pursuers slipped chain hobbles around her ankles. The city made a parade of her slow march back to captivity. A procession of gawkers trailed Alice all the way back to Liberty Park1. Princess Alice's escape attempt was only one manifestation of her apparent discontent. Over a year after the incident, on April 29, 1918, the elephant gave birth to her fourth calf, Prince Utah. Though Prince Utah was celebrated as the first elephant born in Utah, the joyousness of the birth was lost on Alice. She had had difficulty with calves in the past. Not one of her previous calves lived more than a few months, and Prince Utah would suffer the same fate as his deceased siblings. Princess Alice, perhaps meaning to spare her calves from a life in captivity, neglected them or actively tried to put them down herself. While with Sells-Floto, Alice attempted to crush her first-born, Baby Hutch, who lived only two months, and refused to care for Tambon and later Little Miracle, who both died within months of being born. Prince Utah died on March 14, 1919, due to injuries suffered when his mother rolled over on him. Such behavior can't be explained, but it evidences a complexity in Princess Alice that belies her image as a simple attraction. The depth of her emotion was reportedly so great she mourned Prince Utah's death, shedding tears and trumpeting. And in 1926 she reacted strongly when her trainer, "Dutch" Scheider, was suspended, going on a 10-day hunger strike until he returned. No wonder the elephant frequently attempted escape: she knew she didn't belong in Salt Lake. Even after moving to her very own compound at the brand new Hogle Zoo at the mouth of Emigration Canyon, away from residential escape routes, Princess Alice tried to flee. In 1947 she forced open her building's doors, destroyed a steel and concrete drinking fountain and uprooted a Chinese Elm. It must have been hard for the elephant to ignore, let alone forget, that despite being animal royalty, her permanent home in Salt Lake was a compound. "Hogle Zoo history full of cute, cuddly, cantankerous critters"
"Living History: The day that Princess Alice became a royal pain"